IN 1978, Presidential Decree 1569 tasked the Barangay Nutrition Committee to train the barangay nutrition scholar who was to be responsible for delivering nutrition services and related activities to the village. These activities included community health, backyard food production, environmental sanitation and family planning. But 40 years on, many barangays in Cebu don’t even have a functional Barangay Nutrition Committee. Soje Tapulado, nutrition coordinator of the Cebu Provincial Nutrition Council, said that even at the municipal level, not all Municipal Nutrition Committees (MNC) are functional. Forty-four towns and seven cities are under the supervision of the Cebu Provincial Government. But the 2018 Our Cebu Program monitoring and evaluation found that only 18 towns and cities had Municipal/City Nutrition Committees, of which 10 were functional, and the rest, partially functional. Those with “functional” Municipal or City Nutrition Committees were Argao, Borbon, Dalaguete, Minglanilla, Pinamungajan, San Remigio and Tuburan towns; and Bogo, Danao and Naga cities. Those with “partially functional” Municipal Nutrition Committees were Balamban, Barili, Consolacion, Cordova, San Fernando, San Francisco, Sogod and Tudela. “Functional” means passing at least 90 percent of the criteria for this indicator in the Provincial Health Office’s Our Cebu Program Scorecard 2018, while “partially functional” means meeting 70 to 89 percent of the criteria. The criteria are (1) presence of a working City/Municipal Nutrition Committee as evidenced by the issuance of an executive order creating the committee, presence of an approved Local Nutrition Action Plan (LNAP), and the conduct of meetings with documentation of at least two meetings; (2) training in Nutrition Program Management by all members of the MNC; (3) implementation of the LNAP activities by the member-agencies; and (4) having an approved Nutrition Situation Report containing the demographic structure of the local government unit, Nutrition Committee organizational chart, nutrition statistics, Nutrition Problem Tree with Spotmap and nutrition interventions. Tapulado said evaluation was still ongoing on the functionality of the Barangay Nutrition Committees. But the Province is already moving to strengthen its nutrition initiatives. “The Cebu Provincial Nutrition Council, headed by Gov. Hilario Davide III, is currently drafting the first ordinance on nutrition, which will then be implemented by all the municipal/city local government units under the Province of Cebu,” he said. Authored by Victoria Toribio, who represents the 3rd Congressional District in the Sangguniang Panlalawigan, the ordinance calls for the establishment of a comprehensive nutrition program to address all forms of malnutrition and sustain nutrition programs in Cebu Province. Among other things, it calls for the Provincial Government to implement programs focused on the Philippine Plan of Action for Nutrition 2017-2022 that includes infant and young child feeding, the integrated management of acute malnutrition, dietary supplementation, micronutrient supplementation, food fortification, nutrition promotion for behavior change, nutrition in emergencies, and overweight and obesity prevention. It also calls for development projects that help improve nutrition outcomes, including farm-to-market roads, a coconut rehabilitation program, the setup of gardens in schools, rollout of discount caravans in depressed areas, provision of potable water, and the conduct of family development sessions on child and family nutrition. Under the ordinance, local government units (LGUs) must come up with comprehensive nutrition programs for children and allocate budgets for their implementation. Barangay Nutrition Councils must help the LGUs come up with these programs, aside from being the primary body to oversee the programs’ implementation. The ordinance also creates the Provincial Nutrition Office under the Provincial Health Office to plan and coordinate nutrition programs, and capacitate nutrition workers. And it requires the Provincial Government to appropriate at least one percent of its Internal Revenue Allotment or annual budget to support the ordinance. At present, Department of Social Welfare and Development (DSWD) 7 officials said that for the malnourished children under two years old in Cebu, they are lobbying with the LGUs to get funds for their nutrition budget from the Gender and Development, and the Local Council for the Protection of Children budgets, in addition to the funds from the social welfare and city health offices, or annual investment plan. “In majority of Bohol towns, there should be a nutrition budget in the barangay and municipal investment plan; otherwise, their whole budget will not be approved,” said the DSWD 7’s Supplemental Feeding Program focal person Melinda Cañares. Ahead of the ordinance’s passage, though, the Province is already showing that it wants tangible results in the fight against malnutrition. It targets a three percent reduction in each of these measures of malnutrition: the number of stunted, severely stunted, wasted and severely wasted pre-school children. Cities and towns that meet this target will get an “excellent” rating in this indicator in the scorecard on Nutrition Program Management. A one or two percent reduction will merit just a “fair” and “good” rating, respectively. 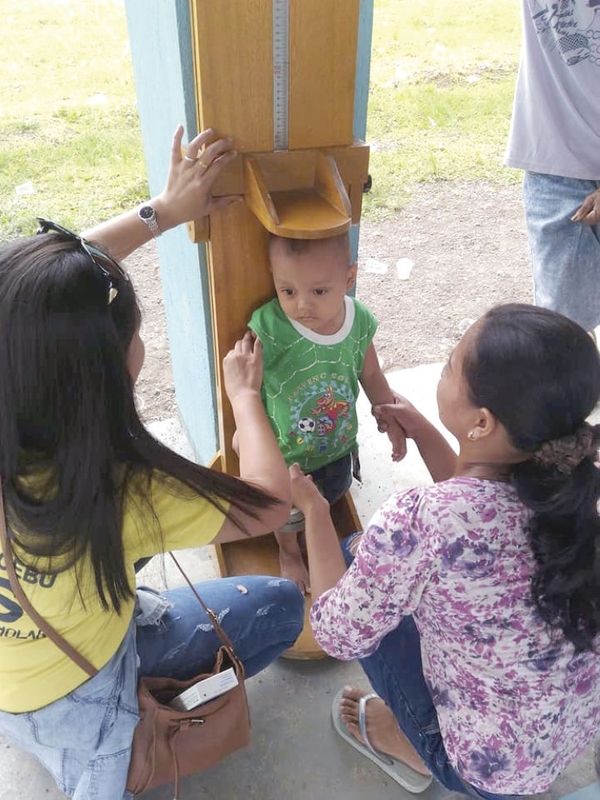 LGUs will also get “excellent” ratings in the relevant indicators if they conduct monthly monitoring of the weight, length and height of their underweight, stunted and wasted children under six years old; if they establish breastfeeding support groups in at least 70 percent of their barangays through the purok (district or zone) system; and if they conduct Garantisadong Pambata services, achieving 80 percent coverage of vitamin A and iron supplementation, and 70 percent coverage of micronutrient powder, and submit timely reports on this twice a year. To ensure that there will be people to focus on the nutrition program, the scorecard gives LGUs with a designated city/municipal nutrition program coordinator a rating of “good” if the coordinator is a registered nurse, and “excellent” if he/she is a registered nutritionist. Those with no coordinator will get an “inadequate” rating. Cañares said that in Bohol, many areas have nutrition coordinators who focus on the nutrition program, unlike in Cebu, where the nutrition program is just added to the work of city or municipal health officers. “In Cebu, except for Mandaue and Lapu-Lapu cities and a few towns, which are active, what happens is that even after the National Nutrition Council (NNC) has trained them for nutrition program management, they still don’t come up with a plan because there is no budget for it. It is just an add-on task for the health officer, who already handles so many other health programs,” she said. The scorecard also gives “excellent” ratings to LGUs that designate one Barangay Nutrition Scholar (BNS) per barangay, and provide a counterpart to the monthly honorarium of this BNS. The repository of the nutrition data in the barangay, the BNS is responsible for the barangay’s nutrition program. NNC 7 nutrition program coordinator Dr. Parolita Mission last year said all Cebu barangays already had a BNS. The only problem, she said, was that with “electioneering,” these BNS were replaced by others allied with the winning barangay captain or mayor after the elections, forcing the NNC to retrain new workers and delaying the delivery of nutrition services to the barangay. Even between elections, the jobs of barangay nutrition workers aren’t safe. In a Metro Cebu barangay, the barangay captain was reelected last May. But all his 10 BNS will be replaced at the end of this month because he had a falling out with an aide of the city mayor, and the BNS are paid by the City government, said Cañares. Any program is only as good as the people who implement it.